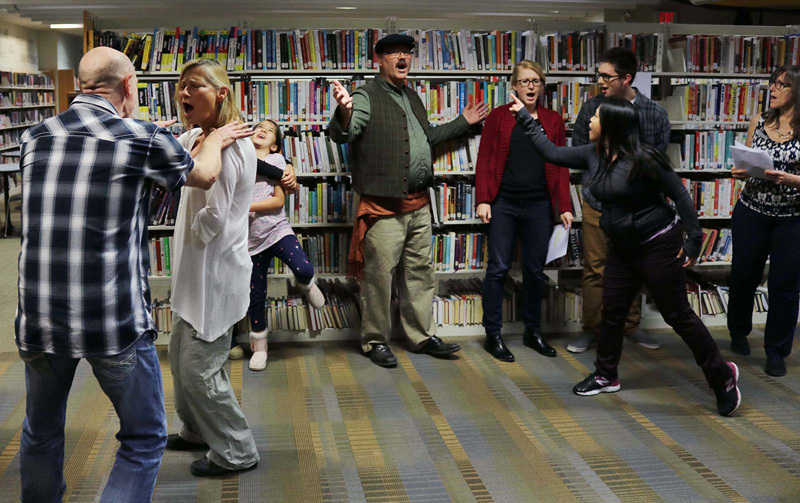 The Chestermere Public Library is working tirelessly to ensure their rendition of “Les Misérables” is the best it can possibly be when they perform Oct. 13. “Most of them were musicals, because that’s kind of my thing. This is fun,” Pease said. He added, “Les Misérables” is a show that he has always wanted to perform in and getting to perform on stage with his daughter is an added bonus. “We’ve never done an actual show together, we’ve sang together, we’ve not done an actual show together like this where she’s played my daughter, so this is fun,” Pease said. For Pease’s daughter Kathryn Pease who is playing the character Cosette, performing is in her blood. Graydon was drawn to the Jean Valjean character, however, the character is difficult to sing. “I’m taking it as a challenge,” Gradyon said. Kathryn’s character Cosette is out of her range, but she is persevering and pushing herself. “It’s an awful lot of rehearing, we sat and watched the movie last night at home just to familiarize ourselves with it again, it’s a lot of practice, and practice, and practice,” Graydon said. For Graydon performing is an opportunity to get out of his own head, and just be something else for a while, and put his energy into creating something that people will want to take part in. “You’re trying to give people an opportunity to have a different experience and so you really-really hope that for that one night you can give them a story, you can give them a glimpse of some history within that context of the story. “When you feel that you’ve done that, you performed as best you can perform,” he said. Although “Les Misérables” is not an upbeat piece, there is power in the story, Graydon said. He added, “When you look at the lives of those people in the French Revolution who were fighting for what they thought were their rights and just the total annihilation that happened, and disregard for life, it was such a dark part of our human history. To support local Chestermere talent and purchase a ticket please visit the Eventbrite website at www.eventbrite.ca/e/do-you-hear-the-people-sing-tickets-48986265238. For more information about Do you hear the people sing? Please visit the Chestermere Public Library Website at www.chestermerepubliclibrary.com.